Sevierville’s neighborhood of Hickory Hollow looks as though it jumped off of a postcard. Steep, winding roads curve with the landscape, providing the homes with spectacular views. The Smoky Mountains loom in the near distance, as tall deciduous and evergreen trees give plenty of privacy to each property. Cabins and log homes are tucked into hillsides and above cliffs, offering breathtaking views of fog-shrouded mountains. It’s easy to imagine these quiet paved streets coated with a dusting of snow, as flakes drift softly onto tree branches and holiday lights dance in the background. It’s the kind of neighborhood where you can imagine families gathering, decorating their homes in festive holiday colors with steaming cups of hot cocoa at the ready. Limited streetlights lead to less light pollution for optimal stargazing, with only the trees rustling in the wind to distract you. 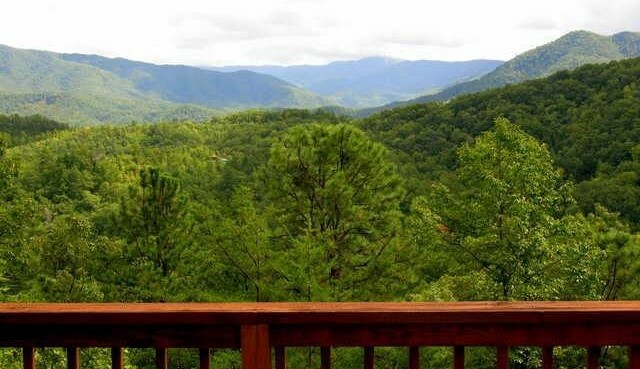 Hickory Hollow is about a thirty-minute drive from the center of Sevierville, offering the seclusion so many are searching for when hunting for the perfect cabin. Yet getting to town is still convenient, and the variety of shopping in nearby Gatlinburg and Pigeon Forge is unbeatable. Having the Smoky Mountains and National Park practically in your back yard has profusion of benefits, from easy access to hiking and fishing to wonderful views year-round. Within the neighborhood, cozy log homes are spread out, angled to take in the best view of those gorgeous mountains without interrupting any neighbor’s view. Grand stone chimneys peek out between trees along the winding roads. There’s a great diversity in the lots, in size, abundance of trees, proximity to the road, and steepness of the slope. Whether you’re searching for a permanent residence or a vacation home, the selection of real estate in Hickory Hollow is excellent. You can view the current available listings here. The local experts at the Jane Terrell team are ready to show you your next home! Do you have a neighborhood you’d like to see featured here? Let us know in the comments!